The newest book in bestselling author Christopher Hart's Figure It Out! series simplifies the basics of drawing people through essential tips and tricks. Geared toward both the general drawing audience and more seasoned artists, Figure It Out! : Simple Lessons, Quick Results offers the basic keys to drawing the human figure, broken down into straightforward steps that anyone can understand and attempt. This is the easy way to learn how to draw people, with no need for in-depth explanations on anatomy or musculature. For example: most figure-drawing books, including previous books in the Figure It Out! series, teach how to draw the torso with a focus on the rib cage, collar bones, pectoral placement, etc. Simple Lessons, Quick Results takes a more straightforward approach by breaking the torso down into three simple, distinct areas that are easy to understand and draw for excellent results without the extra information. In another example, Chris focuses on drawing the natural curves of the body as opposed to drawing muscles, which would require much more time to explain and absorb. Many of the final drawings in the book are presented in full color and shown in basic clothing as well, making them more representative of real people one would see every day. Using the signature, simple instruction that Chris is known for, Figure It Out! 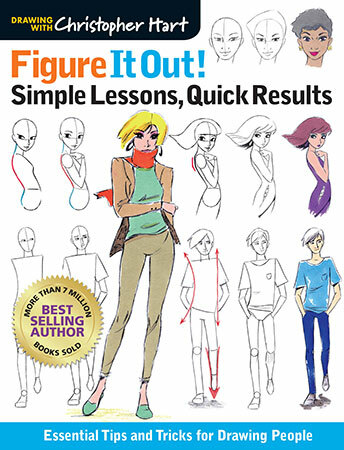 : Simple Lessons, Quick Results is designed to solve common figure-drawing problems that aspiring artists can relate to. With this book, anyone with even a passing interest in drawing will immediately grasp the basics of drawing people—and get the quick results to prove it! Paperback • 8.5 x 11"